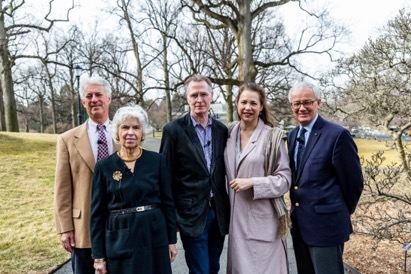 Gathered in front of the Tulip Tree Allee shortly before the screening, Film Director Stephen Ives (center) is surrounded by (left to right) John Beardsley (Film Interviewee), Lynden Miller (Film Narrator), his wife Anne Cleves Symmes and Sir Peter Crane (Moderator). 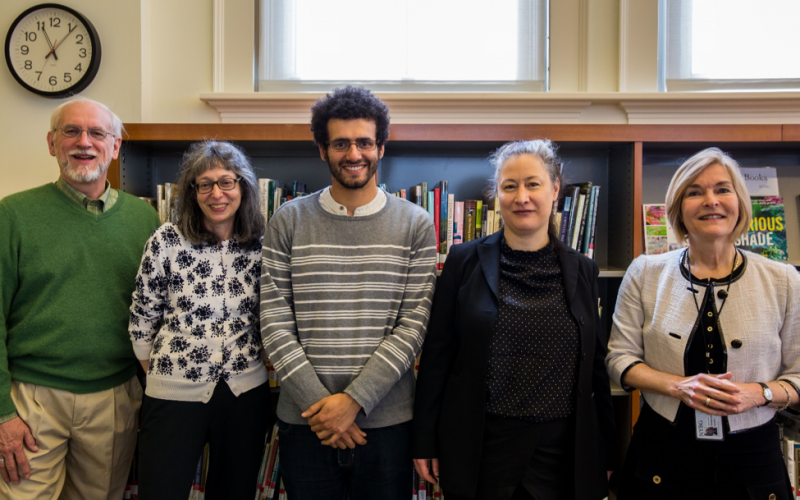 Friday, March 15, 2019 marked the Sixth Annual Humanities Symposium. To celebrate the occasion, the Humanities Institute, together with NYBG’s Department of Adult Education, invited audiences to the screening of an important new documentary, Beatrix Farrands’s American Landscapes. Opening the program was Carrie Rebora Barratt, Chief Executive Officer and William C. Steere Sr. President of NYBG, who enthusiastically welcomed the audience stating that the film screening could not have been timelier as March was Women’s History Month. She continued to say that celebrating Beatrix Farrand—the only female charter member of the American Society of Landscape Architects—was to acknowledge the vital role women have played and continue to play in American history and culture today. On September 20, 2018, The New York Botanical Garden’s Humanities Institute, NYBG Herbarium, and NYBG Conservation and Horticulture staff, students, and fellows visited Barnard College. They were invited for a special botanical Open House at the Arthur Ross Greenhouse in conjunction with the 20th Anniversary of this remarkable facility. The Arthur Ross Greenhouse is a large, state-of-the-art structure balancing high above Broadway & 120th Street atop Milbank Hall that is open to the Barnard and Columbia communities and used by its faculty to teach students about plants and plant evolution. 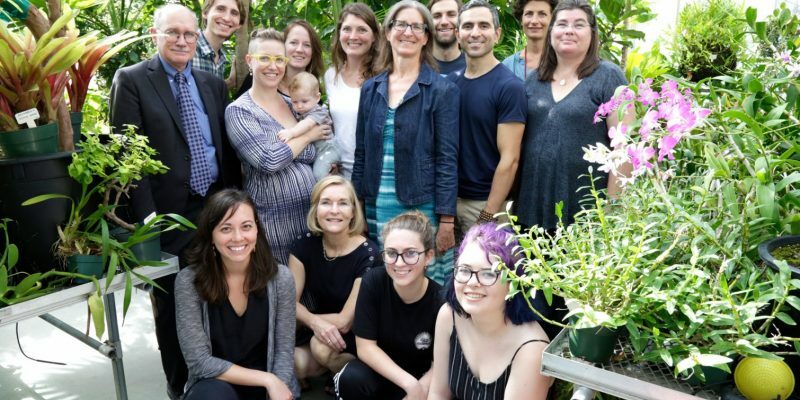 Each summer the Humanities Institute, supported by the Andrew W. Mellon Foundation, welcomes Junior Mellon Fellows to conduct their own research at the New York Botanical Garden. They are invited to discover the resources held at the LuEsther T. Mertz Library, its Archives, the William and Lynda Steere Herbarium and the Garden’s Living Collections. As they prepare to leave after their summer of research, they are asked to present their findings to colleagues, NYBG staff, their institutional advisors and professors from surrounding universities, as well as an interested public audience. On Friday, August 17th Keren Alfred, a recent graduate from Brown University, and Vanessa Sun, a current student at the Macaulay Honors College at Hunter College prepared to share their findings. As an introduction to her presentation The Development of Jamaican Root Tonics, Keren Alfred offered a taste of various Jamaican tonics at the reception’s refreshment table, which was enjoyed by all. These tasty fermented beverages are used widely throughout Jamaica and Jamaican communities as health aids of various kinds, she explained. Working together with Dr. Ina Vandebroek, Matthew Calbraith Perry Associate Curator of Economic Botany and Caribbean Program Director, Keren spent the summer looking at the development of root tonics from an ethnobotanical, community-health, and cultural-historical point of view Using historical literature on Jamaican plants from the Mertz Library, Alfred set out to discover when tonics were first developed or introduced in Jamaica. She found the earliest reference to tonics to be dating back only to 1927, more recently than expected, while it was not until 1953 that the word “tonic” itself was actually used to describe the plant-based beverages Sarsaparilla smilex and Smilex aspera were among the plants singled out by Alfred’s research as key ingredients to root tonic. Janet Brown and Peter Wohlleben standing in the snow at the Tulip Tree Allée. This year’s Humanities Institute Symposium again brought together a large body of students, scholars, horticulturists, foresters, environmental specialists, tree-lovers, and other researchers and professionals to explore a topic vital to this day and age. While last year’s symposium looked at the challenge of climate change, this year’s symposium, Plant Intelligence, was focused on an equally challenging question: Do plants have intelligence? Using the latest biological evidence, several renowned scientists explored this key question by sharing new discoveries in forest and lab, offering new insights into the inner life of plants. Their findings—including astonishing examples of plant signaling and information processing—challenged the audience’s common perception of plants and presented new paradigms for the understanding of nature. On September 7, 2017, The New York Botanical Garden’s Humanities Institute and the Foundation for Landscape Studies, New York, co-hosted the Colloquium Carmontelle’s Jardin de Monceau: Celebrating the unique Garden Culture of 18th-century France, held in the LuEsther T. Mertz Library’s Shelby White and Leon Levy Reading Room. The Colloquium marked the starting point of an important project: the publication of a facsimile edition in English of the richly illustrated Jardin de Monceau, an impressive folio-sized volume by Louis Carrogis de Carmontelle (1717–1806), published in Paris in 1779. Designed by Carmontelle for the Duc de Chartres, the actual garden of Monceau still survives today, though in different form, as the much-frequented Parc Monceau at the heart of Paris. 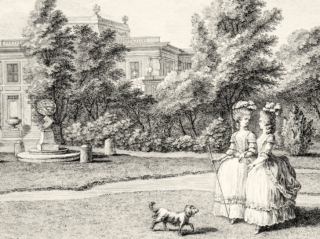 The original layout of the garden, with its rich architectural and sculptural features, formed an ideal social setting for the fashionable elite shortly before the French Revolution—a watershed moment in European history that would bring to an end the glamorous lifestyle and mode of garden design reflected in this work. Carmontelle’s Jardin de Monceau is a key cultural monument in the history of European landscape design, garden architecture, and horticulture, as well as printmaking and fashion design. 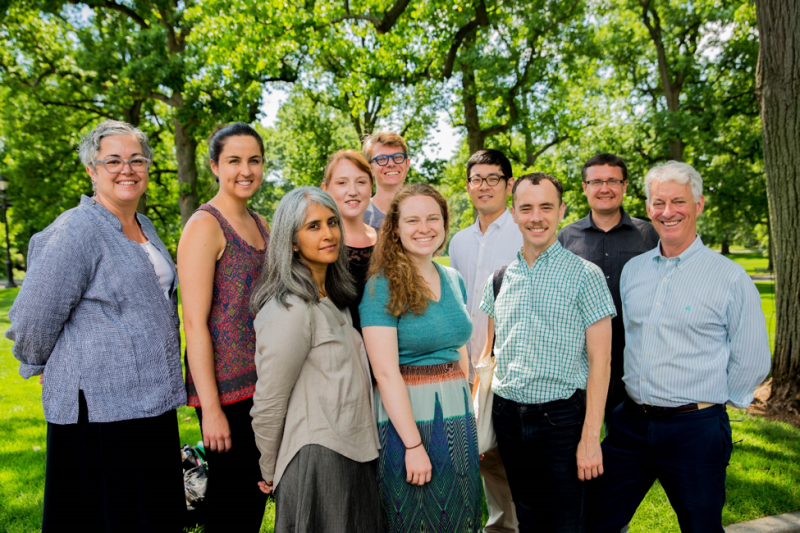 During the last week of June, the Humanities Institute at NYBG hosted a special Study Day for a group of landscape historians and professionals, including architectural historians, garden and landscape designers, and urban planners. The aim of this program was to provide current students and professionals with a comprehensive insider tour of The New York Botanical Garden as one of America’s foremost urban green spaces—a national landmark comprising historic buildings and rare plant and book collections. 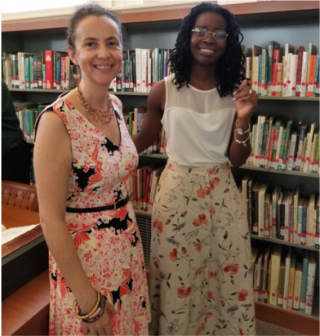 On May 12, 2017, the Humanities Institute of The New York Botanical Garden and the New York Academy of Medicine Library co-presented the Garden’s Science-Humanities Seminar featuring the French scholar Samir Boumediene, from the Centre National de la Recherche Scientifique, Lyon. Boumediene’s talk was entitled A New World of Medicines: Amerindian Pharmacopoeias During the Spanish Colonization, and he spoke to a completely filled Mertz Library Reading Room. Boumediene’s presentation focused on his new—and already largely sold out—book, which, based on his Ph.D. dissertation, had just recently been published in France as La Colonisation du Savoir, Une Histoire des Plantes Médicinales du Nouveau Monde,1492–1750 (Vaulx-en-Velin: Les Éditions des Mondes à Faire, 2016). 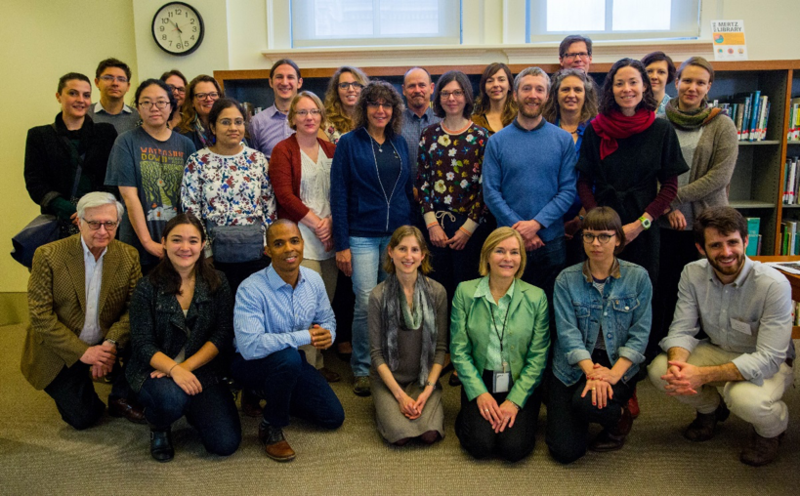 Participants of the workshop “Biodiversity and its Histories” gather in the Humanities Institute, Mertz Library, NYBG. Over the course of the last three months, The New York Botanical Garden’s Humanities Institute and the Center for Science & Society at Columbia University have opened the front in a collaborative campaign for renewed dialogue about conservation, climate change, and the numerous other challenges that face the protection of biodiversity and the environment in the 21st Century. 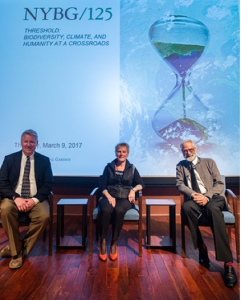 On March 9, the Humanities Institute’s Fourth Annual Symposium was held at the Garden, offering a vital discussion among three renowned experts, and the larger public, on biodiversity and nature conservation in the era of climate change. Convened by the Humanities Institute and the Center for Science and Society, as well as History Initiative at Columbia University, this symposium served as a critical introduction to key issues about modern society and its relationship with the environment. Challenging issues such as the possibility of future life on Earth, participants were invited to ask themselves the following questions: What does biodiversity mean in the broader context of 21st-century environmental politics and ethics and in the specific case of the 2016 Paris Agreement? Is there a common, sustainable future possible in this new period of American isolationism, when Washington threatens to pull out of global environmental treaties, such as the 2016 Paris Agreement? What are the most urgent eco-political and ethical laws that need enforcing to ascertain the availability of the world’s natural resources to tomorrow’s generation? Challenging questions that need expert knowledge and guidance.